This Okra Palya is so easy, quick, and tasty, that you’ll want to buy okra every time you see it to whip up this dish! If you like roasted okra you’ll love this dish. But, even if you haven’t developed a taste for okra so far, this recipe may just change your mind! So, give it a try! Okras (also called ladies finger) are low in calories, rich in fibre, and rich in Vitamins A, C, B, and K! Yup! And they are great for diabetics because the mucilage (the part that gets gooey if not cooked properly!) aids in digestion and slows down the uptake of sugar in the digestive tract. Palya is a Kannada word for a dry, vegetable curry that is an easy, tasty way of cooking your veggies! 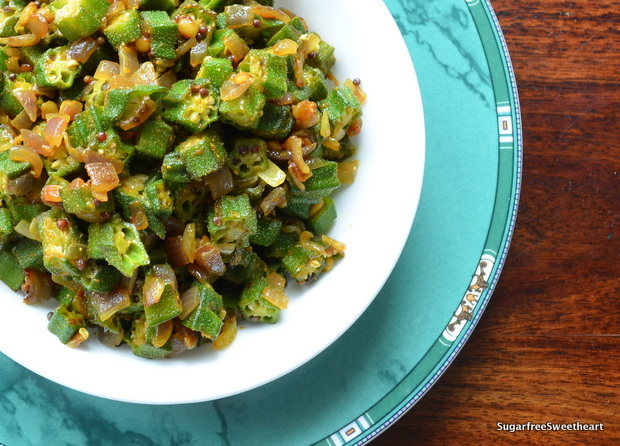 This Okra Palya is another of Mom’s recipes that my sister and I absolutely love. And this is exactly the way she makes it! This Okra Palya is great with rotis and also with rice, especially if you like dry curries with rice. The recipe is simple, but be sure to check out the Tips below, because in this recipe, they will make all the difference! This recipe is suitable for diabetics, weight watchers, and those who’d say ‘ooh yay! okra’! This time, the TIPs are really important! The trick to a great Okra Palya is a two-part secret. Part 1: Ensure the okras, your chopping board, and knife are all absolutely DRY before chopping them up. Keep a tissue paper handy to wipe any goo/slime that builds up on your knife as you chop. Dry okra = minimum goo in your palya! Part 2: Roast your okra pieces thoroughly on a medium low flame. They have to become a deeper, darker green than when you started and getting a bit of char on them only helps the taste! While choosing okra at the supermarket, check if the bottom tip of a sample piece breaks off easily. If it does then the batch is good to buy. If it doesn’t then buy something else (don’t go nipping a whole lot of pieces and then blame it on me!). For a slightly different version that uses kalonji and mango powder (amchur) do check out this Bhindi Fry from Whit Bit’s Kitchen! November is Diabetes Awareness Month and Sugarfree Sweetheart will be abuzz with posts! I’ve planned a Diabetic-Friendly Food Week for the third week of November, and there will be fun challenge to you try out on World Diabetes Day in the second week. The blog will be getting a bit of makeover too! Coming soon! I love okra. Thanks for sharing useful information. I enjoyed reading and the dish looks delightful! Bhindi is my child’s favorite veggie.. she can have it 24/7. I love the way your mum makes it. Thanks Namrata! I think okra is one of those veggies that people either love or hate! Ooohhh…this looks so tasty. And I’m always looking for okra recipes…especially ones that have less goo! Must try this ASAP! I always had a texture issue with okra until I read somewhere that sprinkling salt on okra and setting it aside for 15m helps and it really does! Aha! Great, another tip to try with the next batch of okra. Thanks Pavithra! I really struggle with okra – I don’t enjoy the texture, which always seems to be a bit wet and sticky. Having said that, this looks good, and doesn’t appear to have that problem. Perhaps I’ll give it another go! See, now that – crunchy and a little bit charred – sounds really great. I’ll let you know how I get on. Wow, I’ve never had bhindi with urad dal before, looks absolutely delicious! I am definitely going to have to try this version next time! And of course, thanks for the ping! OMG.. I just want to get my hands on a spoon & dig in.. 🙂 I love Bhindi..! Oh you making me feel like a celeb.. comeon.. 🙂 I’m just another blogger like you..! I had to make use of all my spare time into something constructive.. after 7 years of being into a full time job.. you get crazy when you are sitting at home..! Hehehhe it sure was… 🙂 guess we should connect elsewhere for chitchat.. 😀 what say?